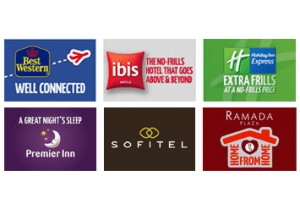 Airport Hotels | Cheap Airport Hotels | Hotelsfinder. Book airport hotels through our partner and you can forget the rushing, the traffic jams and the time-keeping stresses. Enjoy a leisurely journey the day before your flight, then relax in the evening before a peaceful night’s sleep. Save up to 40% and wake up knowing you’re only minutes from the terminal, then take your time to enjoy a hearty breakfast before you make your way to the airport. A whopping 1.2 million travelers have booked a hotel with Holiday Extras in the past two years. Their airport hotels received an average rating of 88% from 290,797 customer reviews. We have Hotels near every major UK airport.